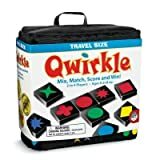 Qwirkle is an elegant tile game, easy to learn and understand, visually inviting, and increasingly challenging as the game progresses. The game can be played by 2 up to 4 players and an average game takes about 45 minutes to play. The game consists of 108 wooden blocks and they display one of six shapes (circle, square, diamond, starburst, clover and "x") in one of six colors (blue, red, yellow, green, purple and orange). There is no board, players simply use an available flat surface. Players begin the game with 6 blocks which they hide from other players. All other tiles go into a big bag that's shaken up to mix everything together. Players take turns, adding to an increasingly complex grid of blocks. To place a block, it must be either of the same color or shape as the adjacent blocks. You can place several blocks, as long as they are in one line without duplicates. If you are fortunate enough to complete a six tile row, which is called a Qwirkle, you receive 6 extra points. Players score one point for each block played plus all blocks adjacent. It is possible for a block to score in more than one direction. The player then refills his hand to 6 blocks and the next player continues. Tactical maneuvers and well-planned strategy is required to win a game. As more tiles are placed, there are more choices, so the search for the high scoring play becomes more and more complex. The game offers a risk-award concept. 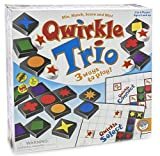 You could get a bunch of points creating a line of five, but lines of five are susceptible for another player to add the sixth tile for a Qwirkle while simultaneously making a new line for even more points of top of the 12 points they're already going to get for the Qwirkle. The challenge is both visual and logical and complex enough for serious adult competition. The strategy is deep, but accessible. And there is also enough luck involved that inexperienced players can keep it close with more experienced players. Another strength of Qwirkle lies in its familiar look. The shapes and colors are easily recognizable and the rules are very simple and quick to learn. 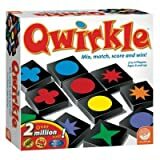 Qwirkle will satisfy anyone who enjoys games like Scrabble, Carcassonne or Ticket To Ride.